Without you and your support, The Mr. Peter Spyros Goudas line of products and associated brands like mama Lucia, pride of Himalaya, Jewel of Indian, lal gate, Manzani oil, blue lake, the lion king, the tusk brand, Tai Tai, Golden Dragon, Tiranga , Cakemaker, Heavenly Bite, Yellowbird, Garlito, Spinorizo, Lentilino, Golden Feather, Snappy pop, etc, etc, would not have survived in today’s turbulent environment for over forty years. It is a well-known fact that I am a work-a-holic, and a sometimes fussy and perfectionist when it comes to food. Many of you know that I produce more than a thousand products from all over the world, which I believe, are the best in the world. Which they should be for my consumers. This is not an overnight process. It takes, years of research, trial, and errors, a lot of understanding of cultures, spiritual beliefs, food preference, etc. etc. In the last few years, I wrote more than 42 books for products that I know well, and I penned more than 500 recipes, with thousands and thousands of pictures to enhance the production of my material to create those books. While there, you may visit the letters of appreciation Section where, if you have a lot of time, you may read the endless lists of acknowledgments documented, from disaster relief foundations, food banks, senior citizens homes, organizations, associations, etc., etc., etc. In addition, I literally immersed myself within all the cultures and different nationalities. I have tried every nationality food through the nature of my business. For example, Read the cow foot story, which although is a comedy details the lengths to which I went to accommodate the request of this culture, in this instance the Caribbean taste and particular the Jamaicans in the early 1970’s, or, the Latino Masa Creation, my Mexican adventure where they beat the mierda out of me. Nonetheless, Latinos love my Masa flour. The Curry Story documents my curry nightmare, where I had visions of dancing goats, The Coconut Tree, referred to as the Tree of Life, The Olive Tree, and others. Nevertheless, of all the products that I have, I recently came to the realization that I do not have any frozen products. I am GETTING OLD OR WHAT?! I AM ONLY 69 YEARS YOUNG AS I WRITING THIS ARTICLE! AND GUESS WHAT! Just last week I received a phone call from a good friend of mine by the name, Peter Rugiano, asking me to pay him a visit and have lunch together. Now you are wondering, who on earth is Peter Rugiano? You may have never heard of him. Let me explain who he is. Peter Rugiano was born in southern Italy in the region of Calabria in 1943. His family owned a restaurant, and from the age of six only a few years after the war, Peter was helping his mother in the kitchen. Therefore, cooking is in his blood and for him, cooking is an art. As he matured, he graduated from chef school in Turino, Italy. Peter Rugiano decided to immigrate to Canada in 1962. He worked as a junior Chef at the Royal York Hotel. At that time I was "sleeping under the hotel of endless stars". In reality, I was sleeping on the benches outside Old City Hall, near the Royal York Hotel (1967) looking up at the stars and dreaming about food. 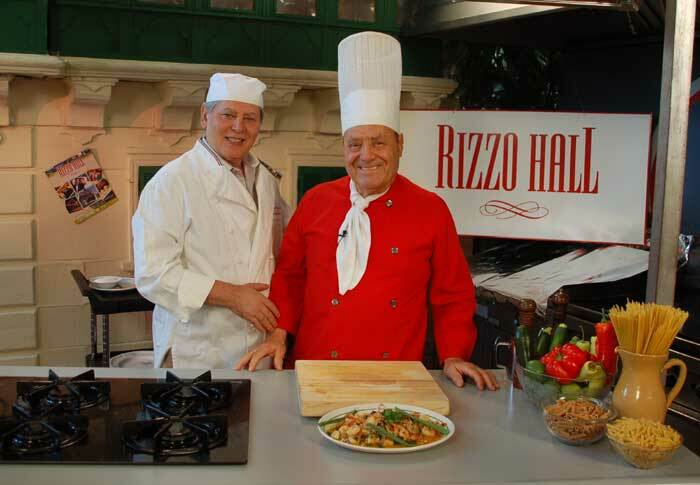 In 1964, he decided to open his own business, a Banquet Hall, called Buffet Rizzo in Montreal. In Montreal along with his Italian experience, he married his knowledge to French cuisine as well. This knowledge made him a cut above the rest. He ventured into restaurants, pizzerias, and taverns. In 1977, with his tools of knowledge, he came back to Toronto and opened his own Banquet Hall business by the name of Rizzo Hall with a 1,500-seat capacity. Over the years within the Hall famous people have, through marriages, engagement, baptisms, anniversaries, etc. visited his establishment: The Broadbent, Ed Phillip, Dalton McGuinty, Joseph Fantino, and (chief before Fantino), the Flynns, Rob Ford to name a few. To my knowledge, it is a very difficult thing to serve lasagna or cannelloni to an Italian due to the fact they always comment that their mother’s lasagna is better than yours. Peter Rugiano, has overcome this criticism and served the Italians without comment, AND IN FACT, WITH TOTAL SATISFACTION, and with a recommendation to other potential clients. Peter Rugiano did not settle on the Banquet Hall business. He is a work-a-holic like me. As a hobby, he engaged teaching his own staff on what he learned over the years. Peter Rugiano, the Chef, has become a television personality. I have an article written in my biography, The Immigrant, titled: Finally, The Two Have Met page 148. Photo of Peter Spyros Goudas and Peter Rugiano Finally, The Two Have Met. (Finally, The Two Have Met) at the 2 years Anniversary Celebration of www.FlyerMall.com in 20 of March 2005, which was held at the Rizzo Banquet Hall. The entire banquet hall was reserved for me, as a gift or exchange for advertising the entire Rizzo Hall in the links of www.FlyerMall.com. Nevertheless, over 3,000 people passed through that day, all of them well fed. Pictures are incorporated in Goudas bio. Peter Rugiano, the Chef, did not settle with simply the Banquet Hall or even the Television program, he has expanded to manufacturing and production of frozen Lasagna, Cannelloni, Penne al Forno among others. These products have been sold in those under “so-called” private brands under different names. When he finally invited me for lunch, he quietly told me that since he has very special recipes that he has never introduced up to now with ingredients that he has developed over his years in business, if I would allow him to use all his ideas in the production of the finest ready to eat pasta products. Furthermore, he believes that the Mr. Goudas name will make these products travel, not just to Italian pasta lovers, but to all the other nationalities who love, trust and are loyal to the Mr. Peter Spyros Goudas brands! In reality, usually, it takes me a very, very, very long time to decide to undertake tasks like this. But deep within my heart, by looking Peter Rugiano right in the eye and by shaking hands with a man who has walked the same path as myself, we both believe when you try this product, you will admit that this is THE VERY BEST. Please view our past birthday photos at Peter Rugiano RIZZO HALL.